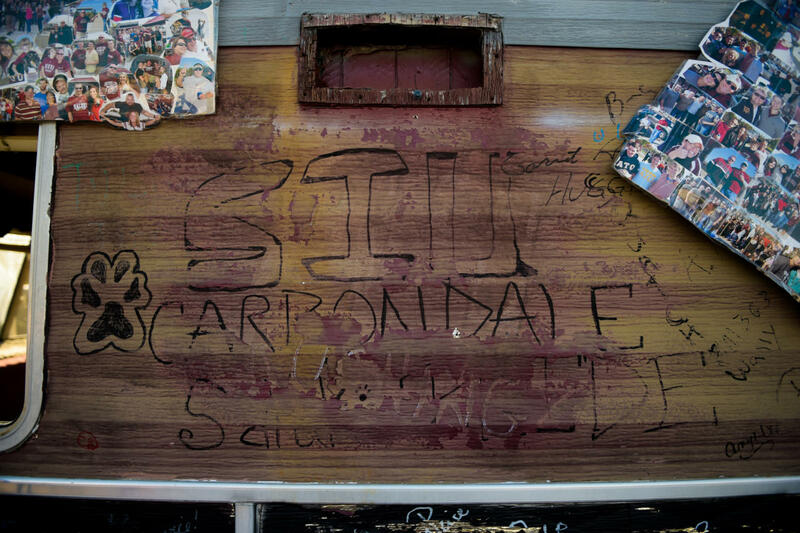 An SIU alumni’s RV is pictured at the family weekend tailgate Saturday, Sept. 30, 2017, before the Salukis’ match against the University of Northern Iowa Panthers at Saluki Stadium. 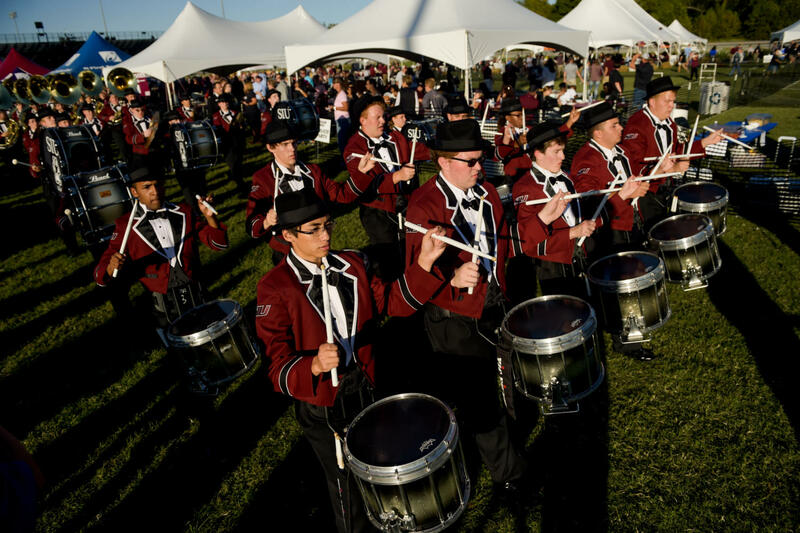 The Marching Salukis’ drumline performs Saturday, Sept. 30, 2017, before the Salukis’ matchup against the University of Northern Iowa Panthers at Saluki Stadium. 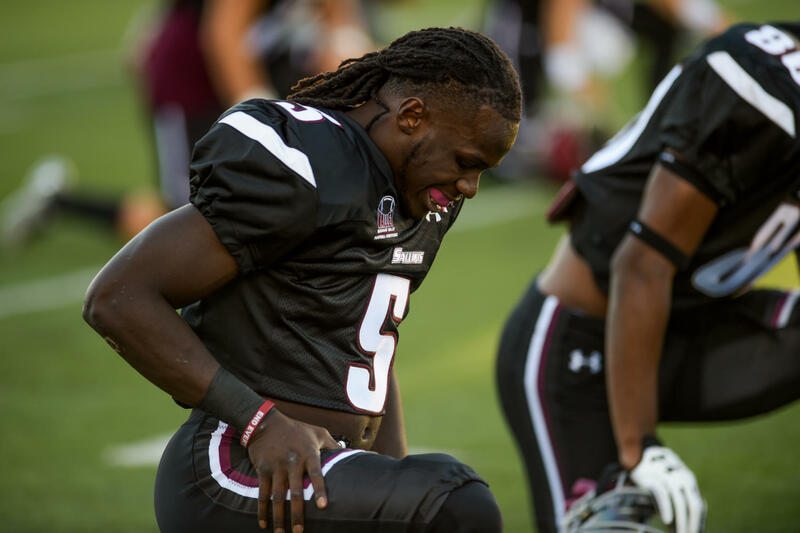 Junior running back Daquan Isom takes a moment Saturday, Sept. 30, 2017, before the Salukis’ matchup against the University of Northern Iowa Panthers at Saluki Stadium. 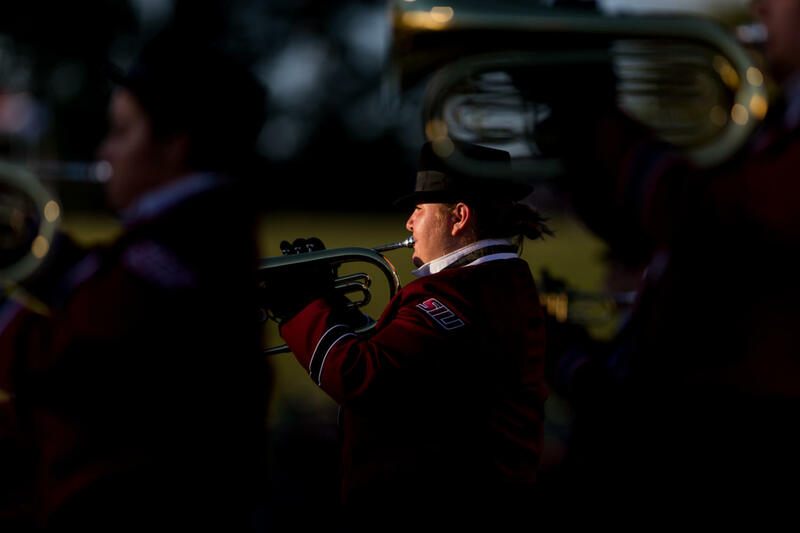 A member of the Marching Salukis performs Saturday, Sept. 30, 2017, before the Salukis’ matchup against the University of Northern Iowa Panthers at Saluki Stadium. 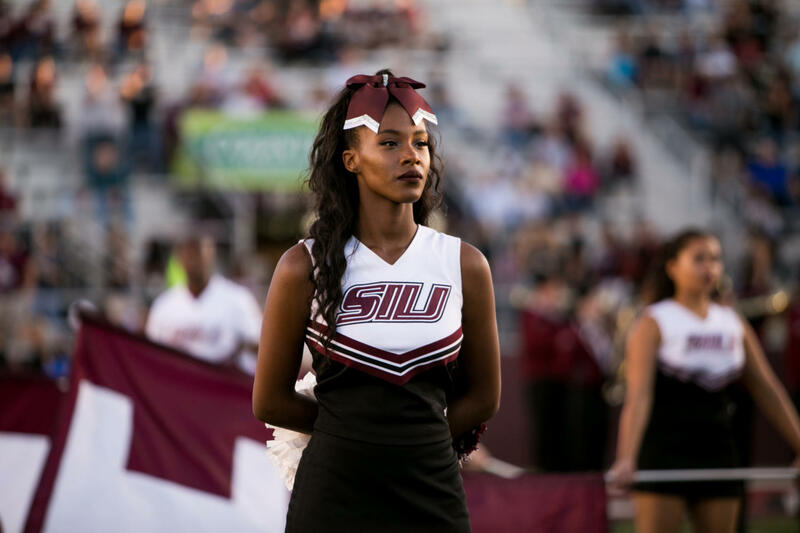 Sophomore psychology major Ariahn Hunt, of Chicago, looks on Saturday, Sept. 30, 2017, before the Salukis’ matchup against the University of Northern Iowa Panthers at Saluki Stadium. 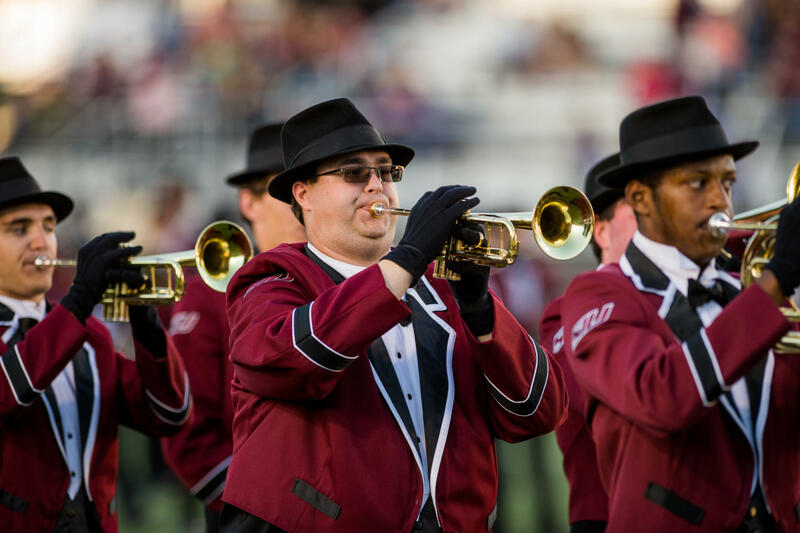 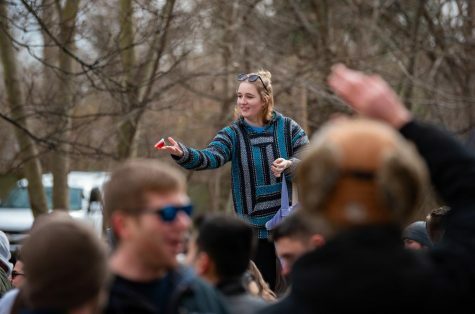 Junior communication design major Mathew Votoupal, of Collinsville, plays the SIU fight song along members of the Marching Salukis Saturday, Sept. 30, 2017 before the SIU’s matchup against the University of Northern Iowa Panthers at Saluki Stadium. 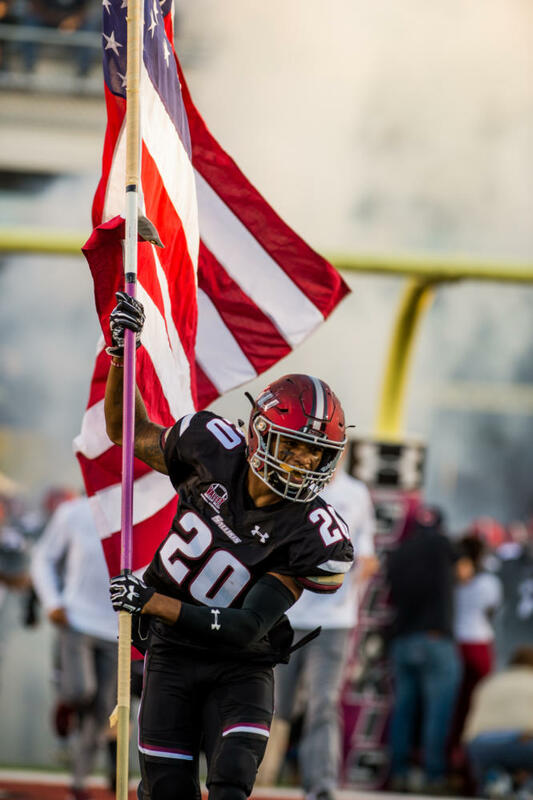 Junior wide receiver Jimmy Jones (20) runs the American flag Saturday, Sept. 30, 2017, before the Salukis’ matchup against the University of Northern Iowa Panthers at Saluki Stadium. 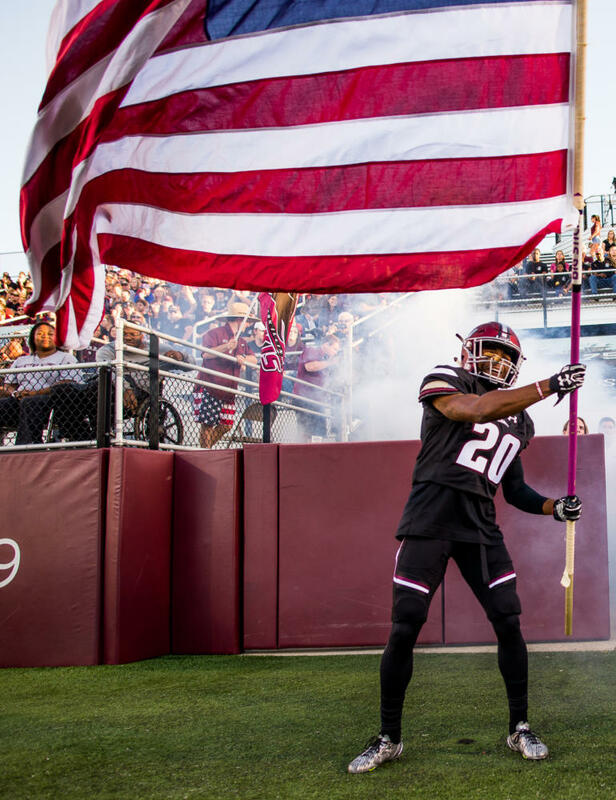 Junior wide receiver Jimmy Jones (20) waves the American flag Saturday, Sept. 30, 2017, as the Salukis rush into the stadium Saturday, Sept. 30, 2017 during the Salukis’ match up against University of Northern Iowa Panthers. 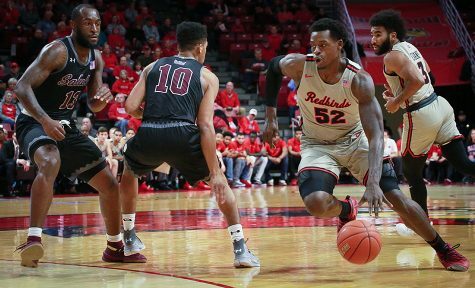 The Salukis fell to the Panthers , 24 – 17. 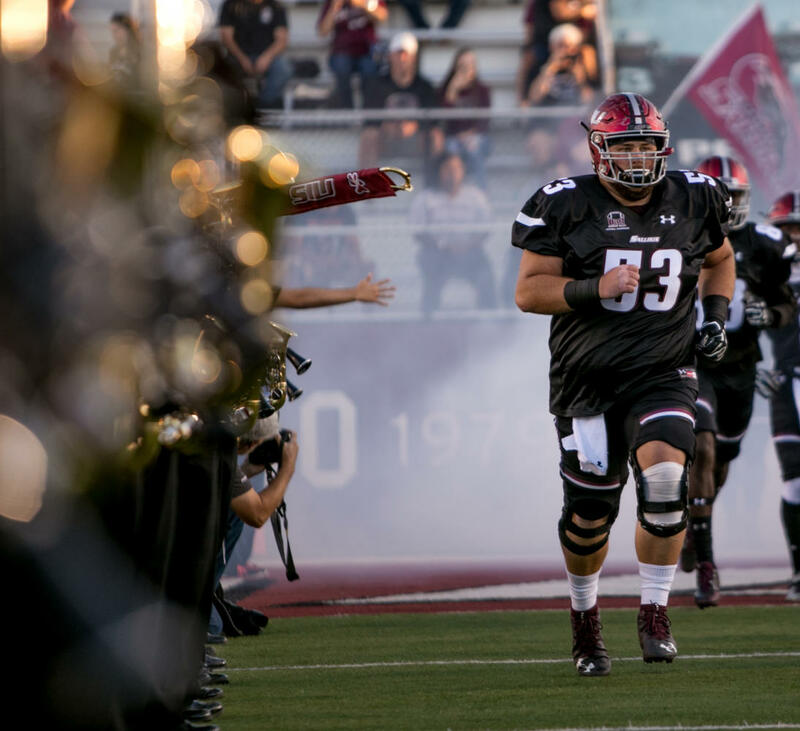 Junior offensive lineman Jack White (53) runs onto the field Saturday, Sept. 30, 2017, before the Salukis’ matchup against the University of Northern Iowa Panthers at Saluki Stadium. 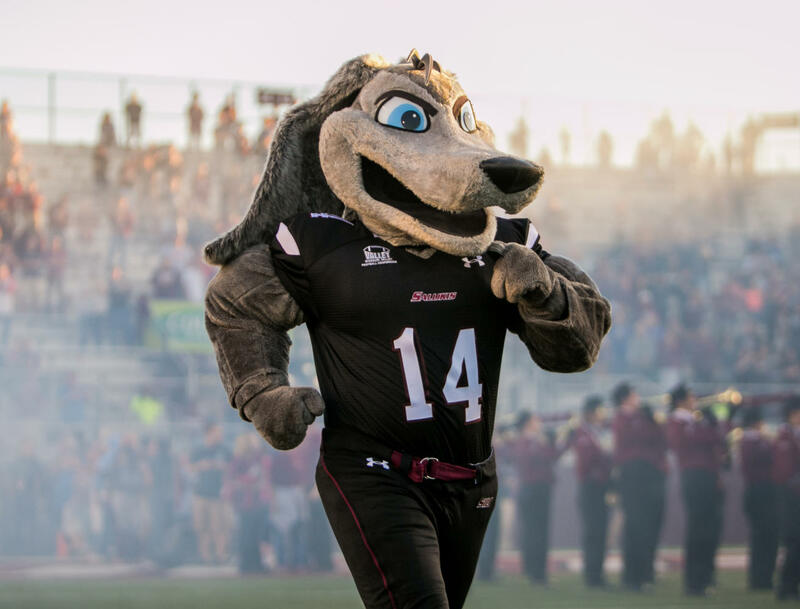 Grey Dawg runs on the field Saturday, Sept. 30, 2017, before the Salukis’ matchup against the University of Northern Iowa Panthers at Saluki Stadium. 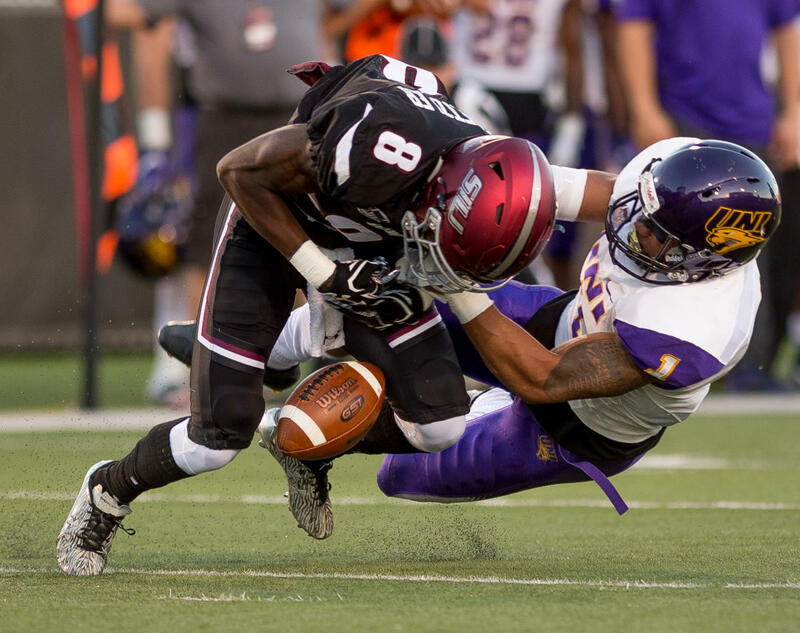 University of Northern Iowa senior defensive back Elijah Campbell (1) tackles SIU junior wide receiver Darrell James (8) Saturday, Sept. 30, 2017, during the Salukis’ matchup against the University of Northern Iowa Panthers at Saluki Stadium. 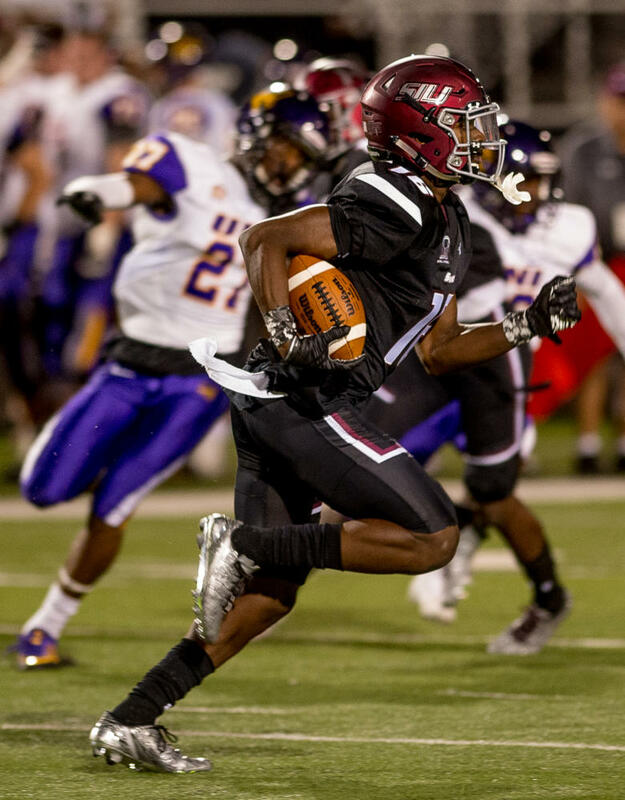 SIU junior running back Daquan Isom (5) runs under pressure of University of Northern Iowa junior running back A.J. 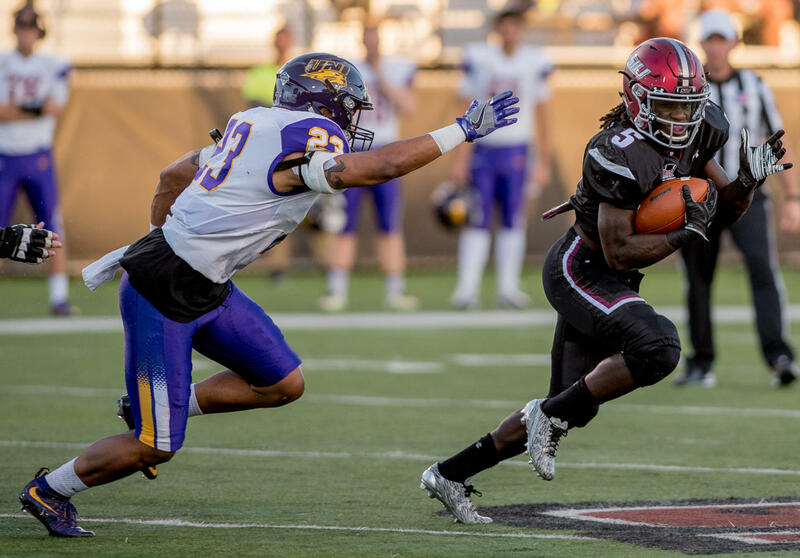 Allen (23) Saturday, Sept. 30, 2017, during the Salukis’ 24-17 loss against the University of Northern Iowa Panthers at Saluki Stadium. 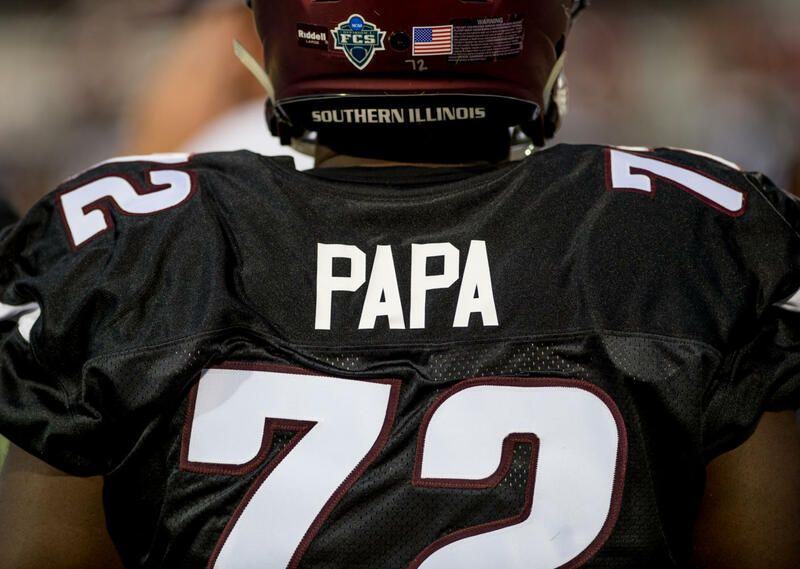 Sophomore offensive lineman Ernest Dye Jr (72) looks on Saturday, Sept. 30, 2017, during the Salukis’ 24-17 loss to the University of Northern Iowa at Saluki Stadium. 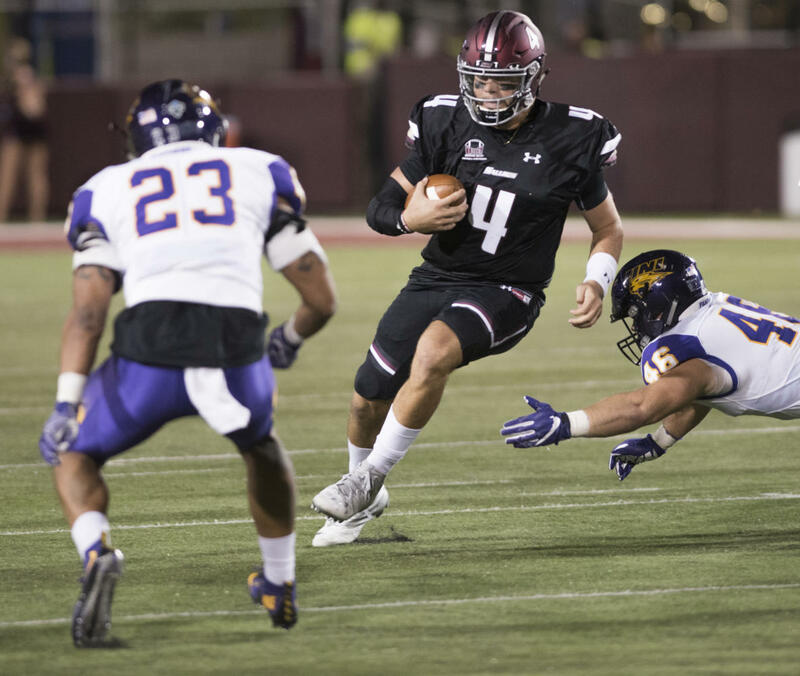 Junior quarterback Sam Straub rushes Saturday, Sept. 30, 2017, during the Salukis’ 24-17 loss to the University of Northern Iowa at Saluki Stadium. 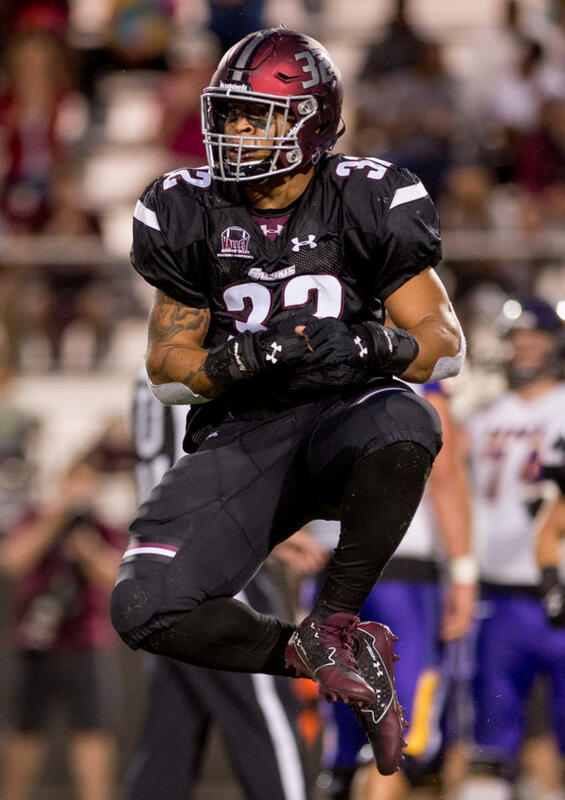 Senior inside linebacker Kryon Watson (32) jumps after a successful block Saturday, Sept. 30, 2017, during the Salukis’ 24-17 loss to the University of Northern Iowa at Saluki Stadium. 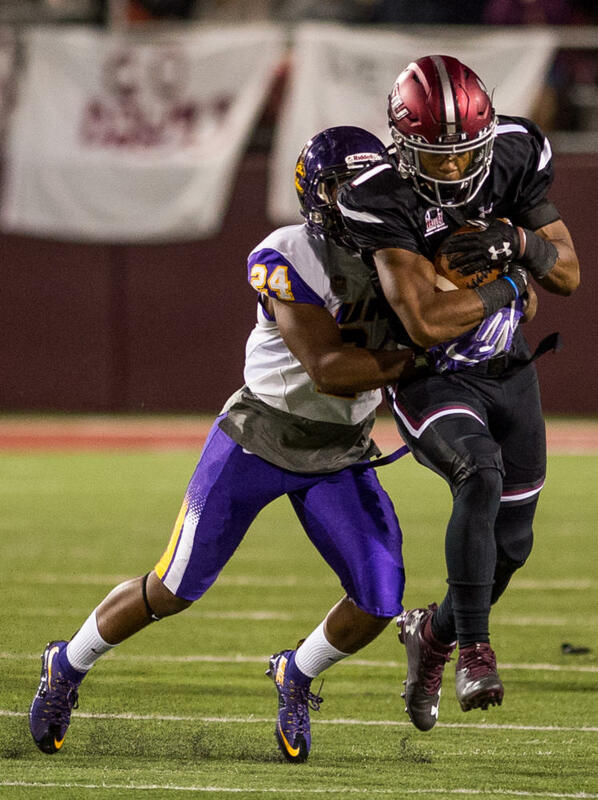 Sophomore safety James Ceasar (16) advances the ball Saturday, Sept. 30, 2017, during the Salukis’ 24-17 loss to the University of Northern Iowa at Saluki Stadium. 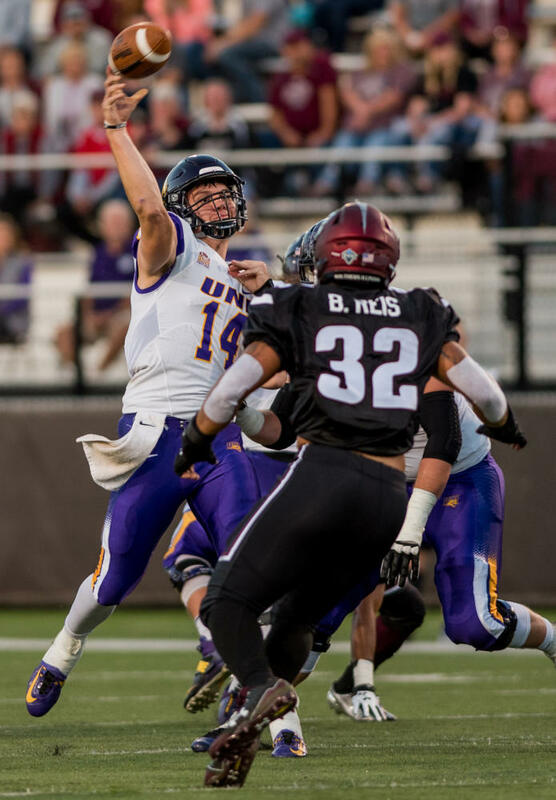 University of Northern Iowa senior quarterback Eli Dunne (16) throws the ball Saturday, Sept. 30, 2017, during the Salukis’ 24 – 17 loss against the UNI Panthers at Saluki Stadium. 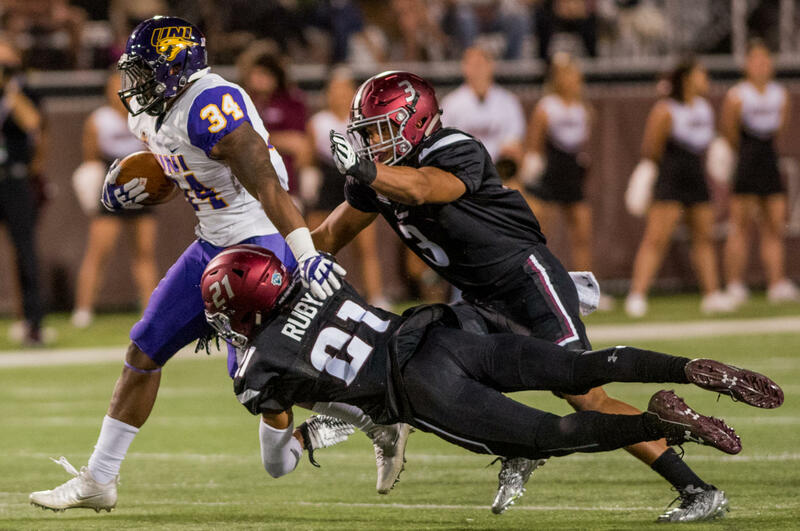 SIU senior safety Ryan Neil (21) tackles University of Northern Iowa senior running back J’Veyon Browning (34) Saturday, Sept. 30, 2017, during the Salukis’ 24-17 loss against the University of Northern Iowa at Saluki Stadium. 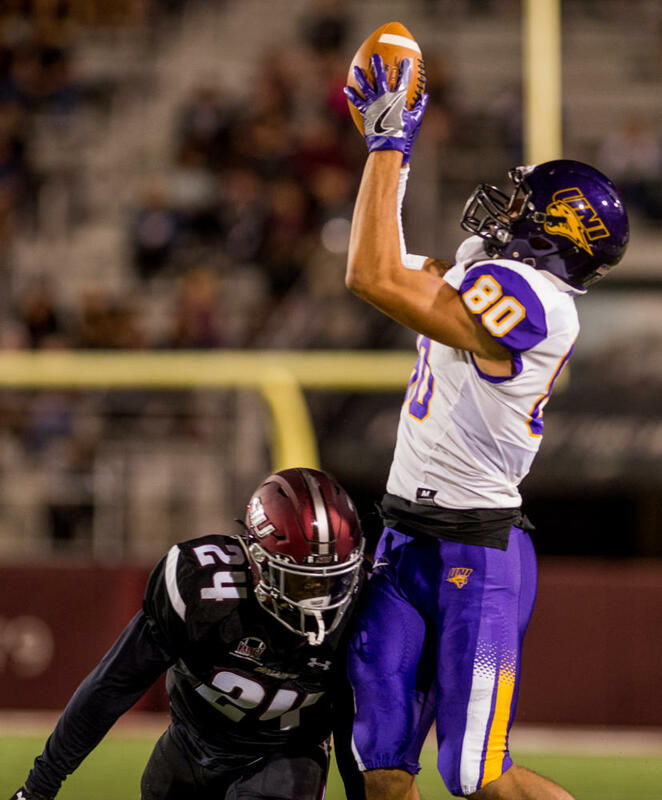 University of Northern Iowa freshman receiver Isaiah Weston (80) catches the ball away from SIU junior safety Jefferson Vea (24) Saturday, Sept. 30, 2017, during the Salukis’ 24-17 loss to the University of Northern Iowa at Saluki Stadium. 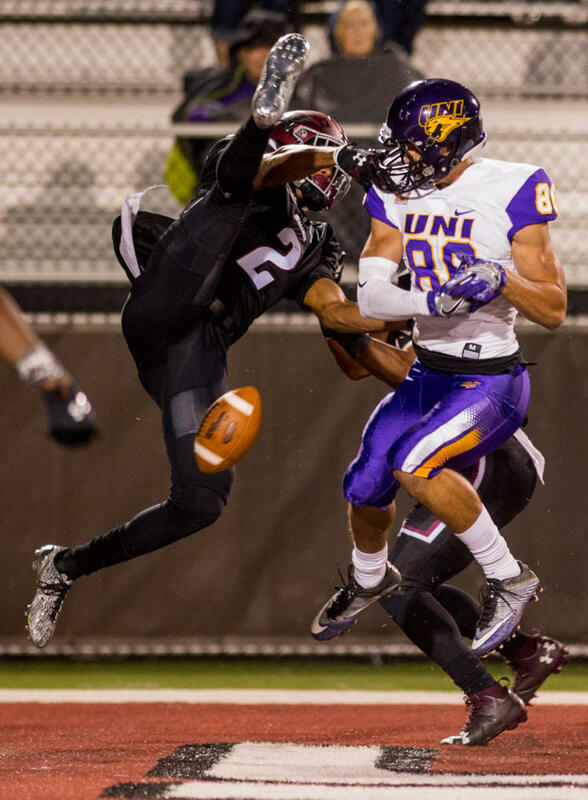 SIU sophomore safety Jeremy Chinn (2) rebounds off of University of Northern Iowa junior punter Michael Kuntz (88) Saturday, Sept. 30, 2017, during the Salukis’ 24-17 loss to the University of Northern Iowa at Saluki Stadium. 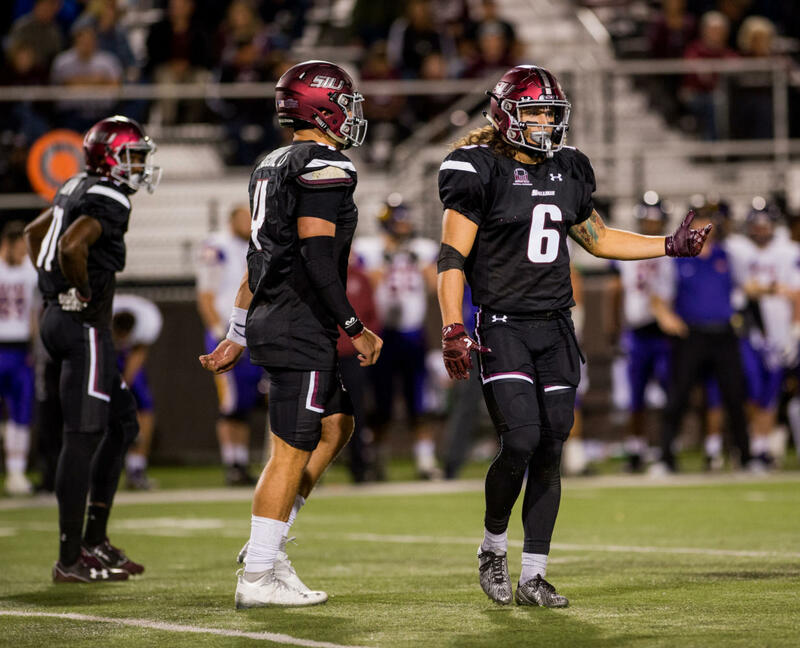 SIU senior wide receiver Connor Iwema (6) gestures towards teammates after a timeout Saturday, Sept. 30, 2017, during the Salukis’ 24-17 loss to the University of Northern Iowa at Saluki Stadium. 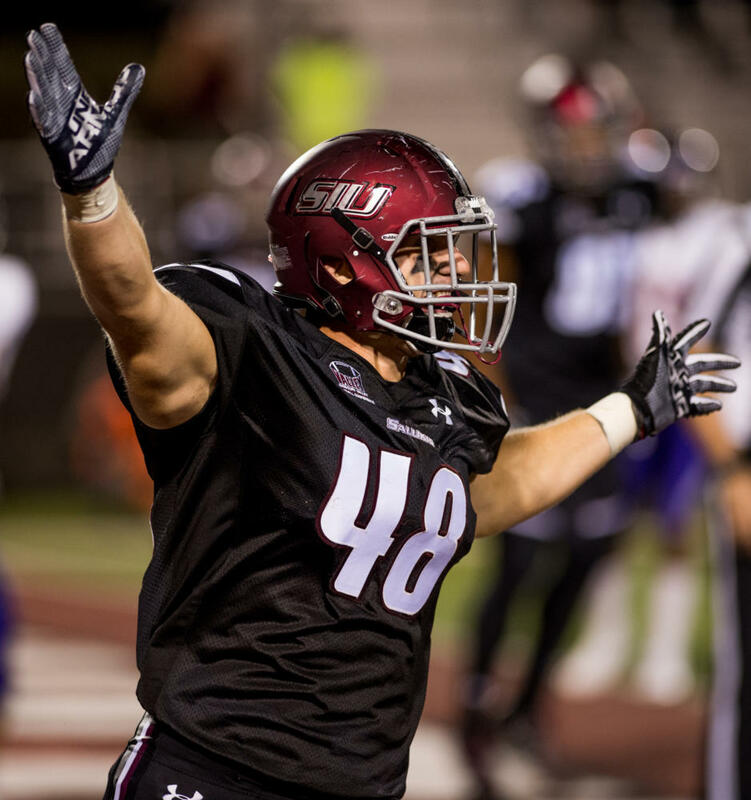 Senior fullback Hans Carmien (48) celebrates after Connor Iwema scores a touchdown Saturday, Sept. 30, 2017, during the Salukis’ 24-17 loss to the University of Northern Iowa at Saluki Stadium. 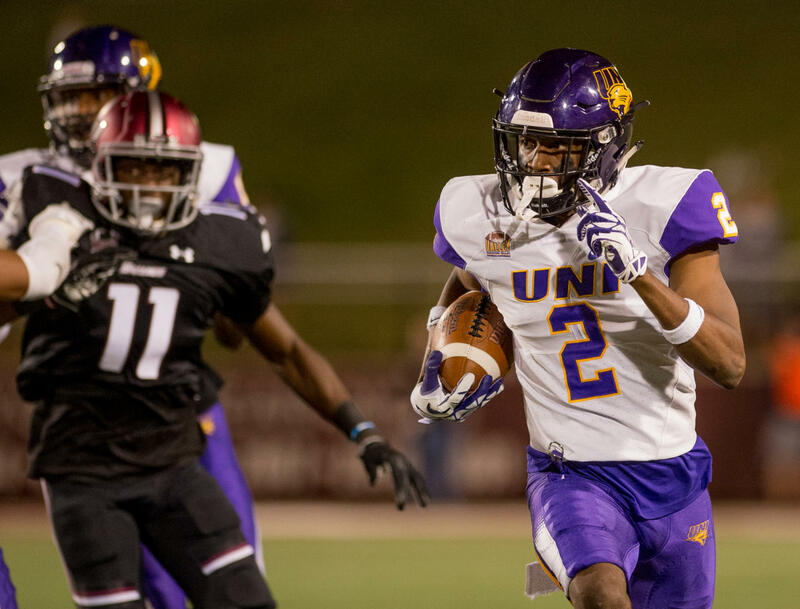 SIU senior cornerback Craig James (1) defends the ball from University of Northern Iowa sophomore defensive back Nikholi Jaghai (24) Saturday, Sept. 30, 2017, during the Salukis’ 24-17 loss to the University of Northern Iowa at Saluki Stadium. 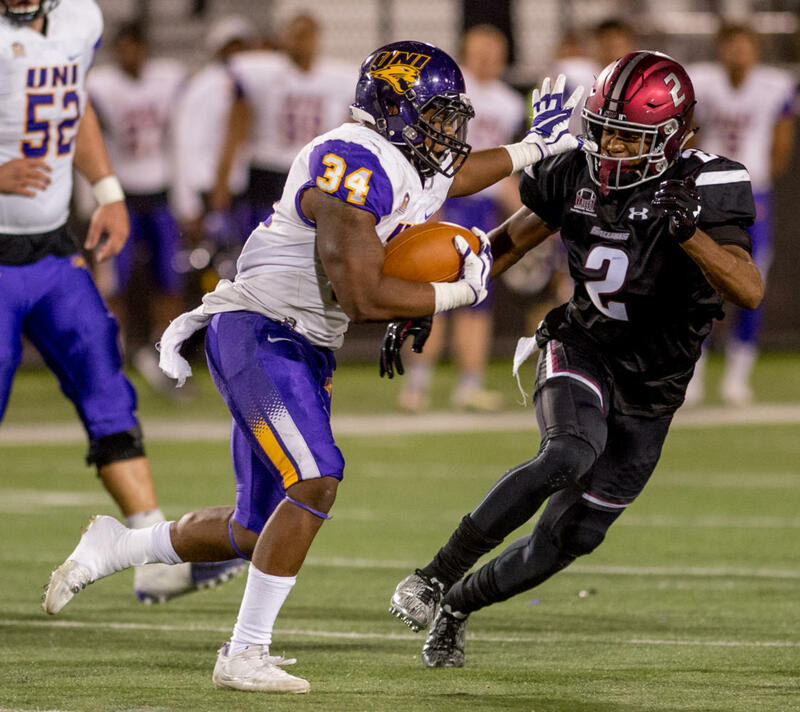 University of Northern Iowa senior running back J’Veyon Browning (34) stiff arms SIU sophomore safety Jeremy Chinn (2) Saturday, Sept. 30, 2017, during the Salukis’ 24-17 loss to the University of Northern Iowa at Saluki Stadium. 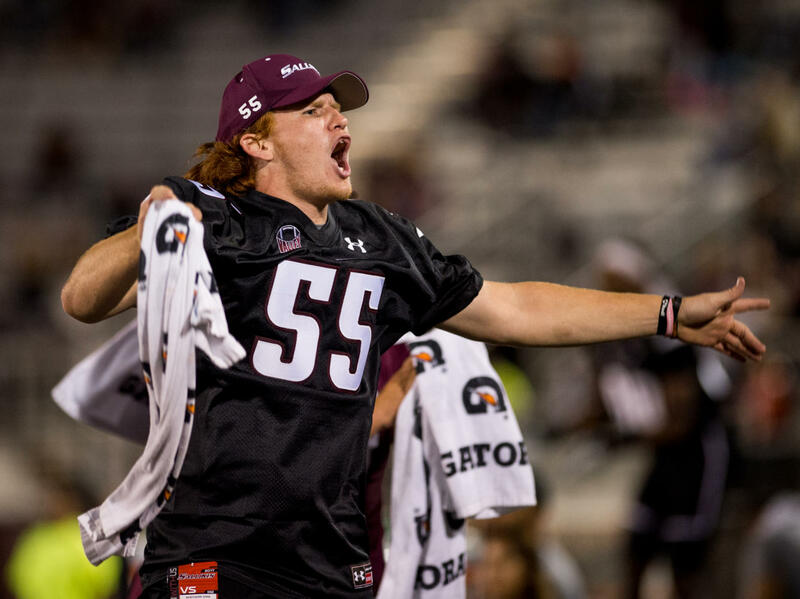 SIU freshman linebacker Luke Giegling (55) pumps up the crowd Saturday, Sept. 30, 2017, during the Salukis’ 24-17 loss to the University of Northern Iowa at Saluki Stadium. 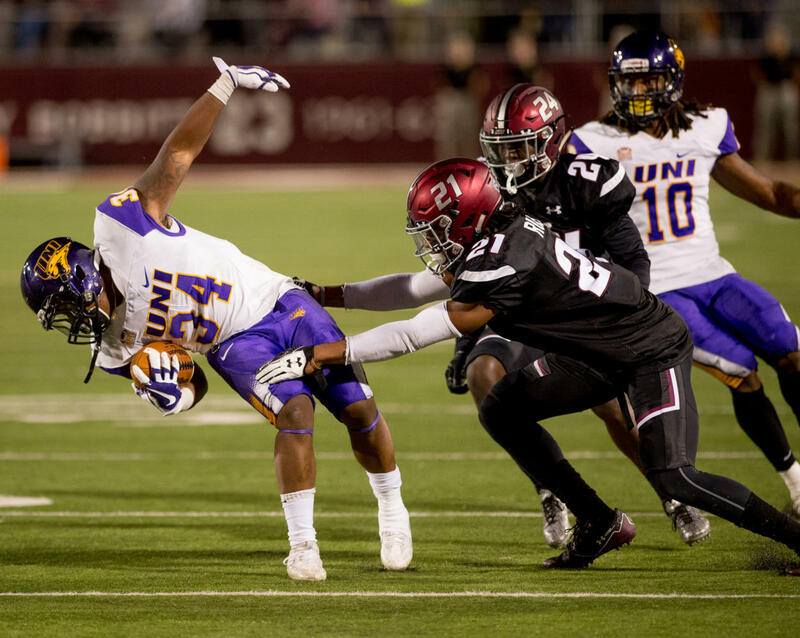 SIU sophomore safety Jeremy Chinn (2) dives for University of Northern Iowa senior running back J’Veyon Browning (34) Saturday, Sept. 30, 2017, during the Salukis’ 24-17 loss to the University of Northern Iowa at Saluki Stadium. 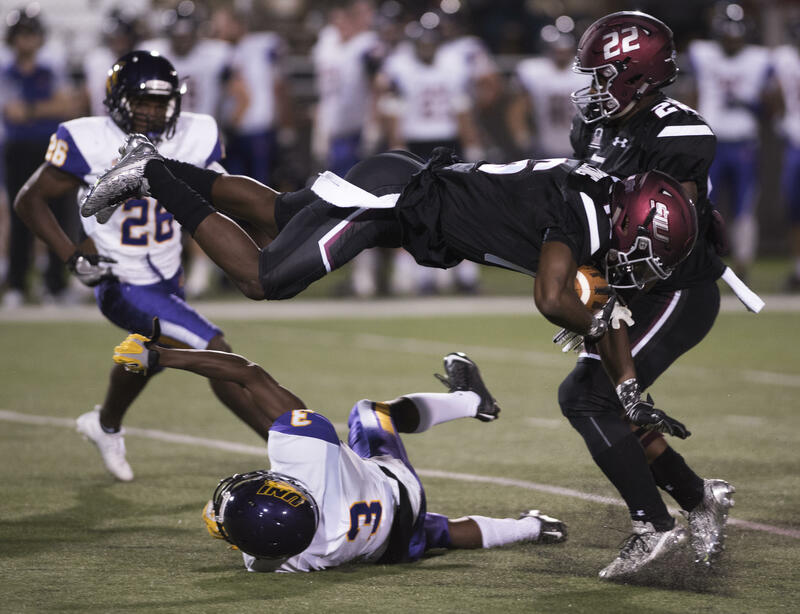 Sophomore safety James Ceasar leaps over UNI junior cornerback Jalen Embry Saturday, Sept. 30, 2017, during the Salukis’ 24-17 loss to the University of Northern Iowa at Saluki Stadium. 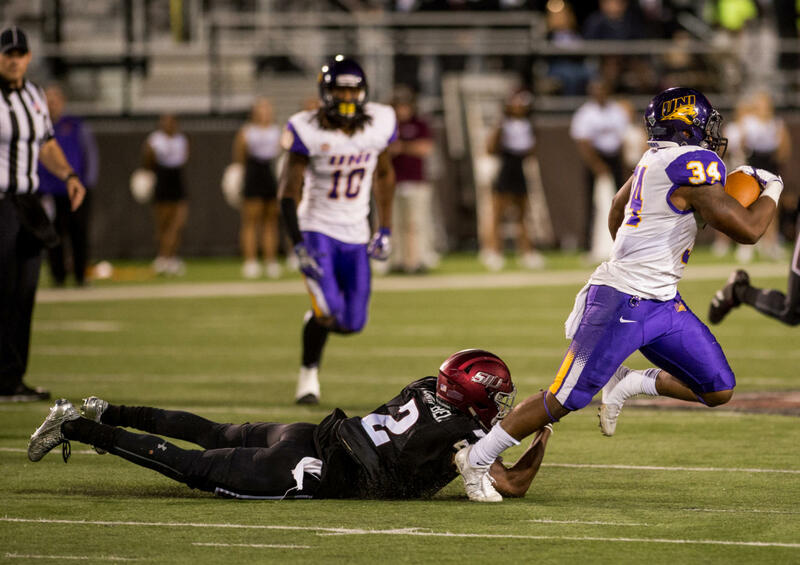 SIU senior safety Ryan Neil (21) tackles University of Northern Iowa running back J’Veyon Browning (34) Saturday, Sept. 30, 2017, during the Salukis’ 24-17 loss to the University of Northern Iowa at Saluki Stadium. 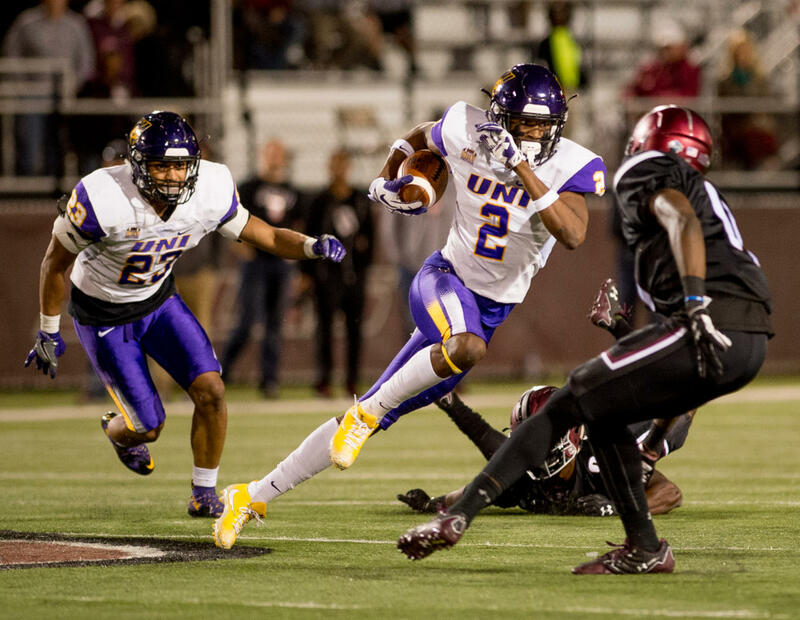 University of Northern Iowa senior defensive back Malcolm Washington (2) advances the ball Saturday, Sept. 30, 2017, during the Salukis’ 24-17 loss to the University of Northern Iowa at Saluki Stadium.